There’s no turning back from the fact that disruptive business automation is here. As artificially intelligent functionality delivers more capabilities that we increasingly take for granted, it’s difficult to grasp all the implications of this transformation. In this eBook, the aim is to illustrate what it means for business, for the people who work in those businesses, and for people served by those businesses every day. 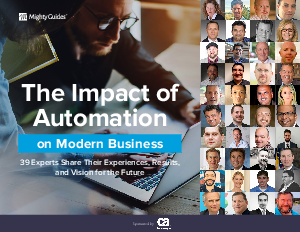 To better understand how automation is changing business, and with the generous support of CA Technologies, we reached out to 39 experts to get their opinion. By providing practical insights into what is happening today and what may be just over the horizon, I believe this eBook will be a valuable resource for anyone planning an automation strategy.